One man's vision of Portage Lake as a summer and winter resort destination. In the late 1800's James and Mary Collen acquired land on the east shore of the Portage Lake. Collen had a vision of a grand resort that would cater to many families, fisherman, hunters, and those just wanting to relax on the shores of a pristine lake. All this just a few miles from the rail station that would bring vacationers from the industrial cities of Southern Michigan. Although the lumbering era was coming to an end in Northern Michigan the early stirrings of industry in the southern part of the state suggested there would be opportunities for those willing to build a new future for their families. By 1900 the James Collen family had opened a restaurant and was planning a resort. After finding some success with their restaurant, it became clear that the future resort needed to offer more to its potential patrons. 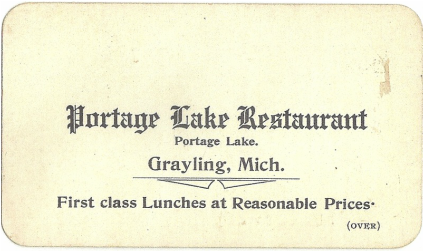 Bus service from Grayling to the resort was added in 1902. By the summer of 1902 the offerings had expanded to a boat livery and overnight accommodations. This advertisement ran weekly in the Avalanche in the summer of 1902. Regular bus service was provided for town folks as well as those arriving to Grayling by train. Best to remember, that in the early 1900's the horse and buggy was still the personal conveyance used by most people. Next came the dance pavilion at Collen's Resort and the Annual Grange Rally and Crawford County Picnic. 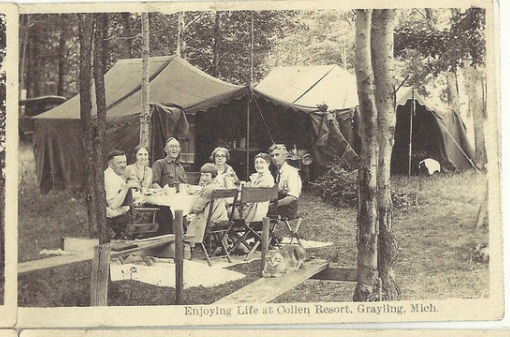 Mrs. Collen and her children forged ahead with James' dream and built a restaurant and dance pavilion at the lake. The Avalanche reported on July 14, 1914 that the opening dance party was a success with Bradley's orchestra providing excellent music. By all accounts the resort and pavilion operated successfully in the ensuing years. In August 1923 a screened porch was added. The measurements of the new porch were 10 by 66 feet owing to the size of the main structure. 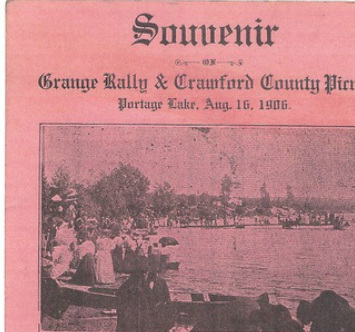 The resort, restaurant, and later the pavilion at Collen's landing was a perfect venue for the annual Grange Rally & Crawford County Picnic. Indeed, the Grange Rally was like a county fair, with prizes for the best of show in a number of animal categories. There also were races on the lake and events for young and old. Based on the pictures and post cards of this summer event, it would appear that a large portion of the 400 souls residing the village of Grayling were in attendance. *Editors note. The Collen family home is the white house at the turn in Margrethe Blvd. It is owned and maintained by four of James Collen's great grandchildren. Grayling, Michigan . The Capital City of Winter Sports. Circa 1920. The first toboggans in the area would slide down Collen's hill onto the frozen lake. Eventually, tobogganing was moved to the Grayling Winter Sports park (now Hanson Hills). But for a number of years personally owned toboggans and riders were pulled up the long hill by horse-drawn logging sleds. And for a time, the Collen's resort and pavilion was both a summer and winter destination. The Collens' family dream was realized. James J. & Mary Amanda Collen with their seven children 1901. Front row: Mary Elizabeth & Samuel Karr seated with their parents.